Self-driving Cars & Trucks Market Demand To Reach 4,223 Thousand Units By 2030: Grand View Research, Inc. According to report by Grand View Research, Inc.The global self‑driving/autonomous cars and trucks market size is anticipated to reach 4,223 thousand units by 2030. An autonomous vehicle is a combination of various sensors and networking systems that assist computers in driving vehicles. The global self‑driving/autonomous cars and trucks market size is anticipated to reach 4,223 thousand units by 2030, according to a new report by Grand View Research, Inc., exhibiting a CAGR of 63.1% during the forecast period. An autonomous vehicle is a combination of various sensors and networking systems that assist computers in driving vehicles. Thus, several technology providers such as Google Inc. and Tesla Motors have also entered the market and are contributing to research and development of autonomous vehicles. The automobile industry is dynamic and is witnessing rapid advancements in terms of technologies. Several major players in the industry, such as General Motors Company (GM), Volkswagen AG, Mercedes-Benz, and Bayerische Motoren Werke AG (BMW), invest a significant part of their revenue in research and development of technologies. Currently, there is a growing trend of autonomous vehicles, thus attracting larger investments from top players. The autonomous cars and trucks market has been segmented on the basis of application into transportation and defense. The transportation segment has been bifurcated further into industrial and commercial applications. 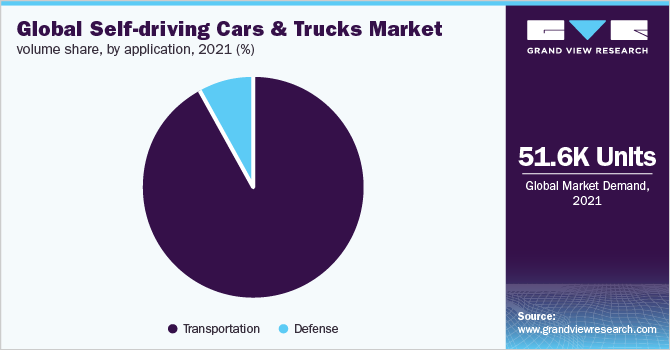 Transportation is expected to have a greater market share while the defense segment is expected to portray the highest growth over the forecast period. The North America region is slated to account for the largest share in the autonomous cars and trucks market in 2020. Demand for autonomous vehicles is expected to increase over the forecast period owing to stern government regulations and rising adoption of self-driving vehicles in U.S.
Audi AG; BMW AG; Daimler AG (Mercedes Benz); Ford Motor Company; General Motors; Google LLC; Honda Motor Corporation; Nissan Motor Company; Tesla, Inc.; Toyota Motor Corporation; Uber Technologies, Inc.; Volvo Car Corporation; and Volkswagen AG are some of the key market incumbents.